So we need to start planning for 2013 — interested parties should contact me at kevin@joeshusterawards.com with their ideas and suggestions for next year. Some of the things that need to be discussed are: coordinators, location, categories and fundraising. Possible locations: Fan Expo Vancouver, Calgary Comic & Toy Expo, Fan Expo Canada, Ottawa Comic Con, Montreal Comic Con. Generally we would like to continue moving around, and with recent ceremonies in Calgary and Montreal, we would like to consider a new location/event with which to coincide so Vancouver, Ottawa and Toronto are all strong possibilities. Given the timing involved we are looking at 2-4 day comic book conventions scheduled between late April and September. Picking a location will allow us to establish a working timeline between now and then for coordinating. Speaking of coordinating, we are currently looking for coordinators for the Gene Day Award and the Harry Kremer Retailer Award. If you are interested, please contact me as above. 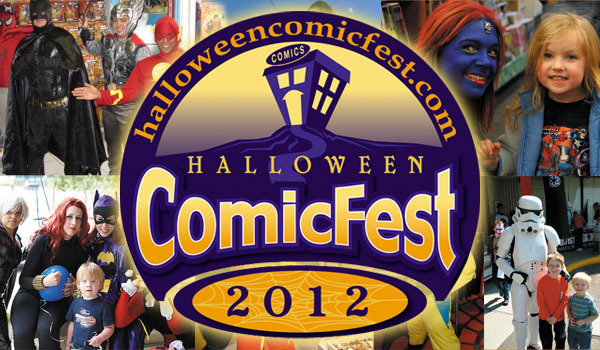 Diamond has engineered a second free comic book day called HALLOWEEN COMICSFEST that is scheduled to coincide with Halloween. Instead of picking a day for everyone to hold it on, they are letting retailers pick which day on which to hold their Halloween ComicsFest activities, and so you should check with your local retailer to see what they have planned and on which day. Chances are it will be either on Saturday, October 27 or on Halloween itself, October 31st. There is a shop locator service on the ComicsFest website (click on the link above to visit). About three weeks ago, upon completion of my 2011-12 contract, I decided not to pursue renewal of my position as a coordinator for Hobbystar Marketing, so I will no longer be involved in Fan Expo Canada/Fan Expo Vancouver/Toronto ComiCON on any kind of organizational level. I do plan to have my store The Comic Book Lounge exhibit at the Toronto events, but the combined workload of the store, a full time job in medical research, as well as other activities (such as the JSAs) requires me to unload some peripheral responsibilities, so this was one of those I’ve decided to cut. This now ends a complete decade of coordinating aspects of Toronto scene comic book conventions. My first major multi-day convention was back in November 2003, although the first one day event was in March of that same year. This entry was posted in Conventions, General Announcements, General News, Happenings by Kevin A. Boyd. Bookmark the permalink.